The present reference 3646 is distinguished by the unusual dark amber colouration of the luminous material of the numerals, the so-called "colour-change" caused by the varying composition of the Radiomir luminous paint used in the production of the first dial series. In Panerai - Una Storia Italiana by Luciano Capullo & Loris Pasetto, p. 91, this phenomena is explained as follows: "The colour of the markers in the dial plate sandwich dials varies from ochre or dark yellow to dark amber. It is likely that these differences arose from the varying zinc sulphide and radium bromide combinations in the Radiomir as the right balance of the two was only established after the delivery of the third lot." The watch is from the "Type C" series of the celebrated model, made between 1942 and 1943, serial numbers ranging from 1'010'091 to 1'010'374. These Type C watches were first used by Italian combat swimmers, as of the second half of 1943 also by German combat swimmers trained in Italy. The watches are distinguished by the length of the wire lugs, exceeding those of the other series of reference 3646. The inside case backs feature the signature Rolex S.A. in the centre, below the signature the reference number followed by the seven digit serial number. For a detailed description of reference 3646 Type C and its characteristics see Vintage Panerai - Watches with History, second edition, Vol. 2, pp. 766 - 775. Reference 3646 is also extensively described and illustrated in Panerai - Una Storia Italiana by Luciano Capullo & Loris Pasetto, chapter "The 40s", including other examples featuring such colour-change dials. Around 1935 and following disappointing tests carried out on watches available at that time, the Royal Italian Navy approached Giuseppe Panerai with the request of designing a watch resistant to extreme conditions while at the same time keeping exact time. The prototype which Panerai submitted to the First Submarine Group Command was called "Radiomir" and passed all tests successfully. A further order was made and following an extensive secret test phase watches were supplied to the Italian naval forces as of 1938. From the beginning, watches with reference no. 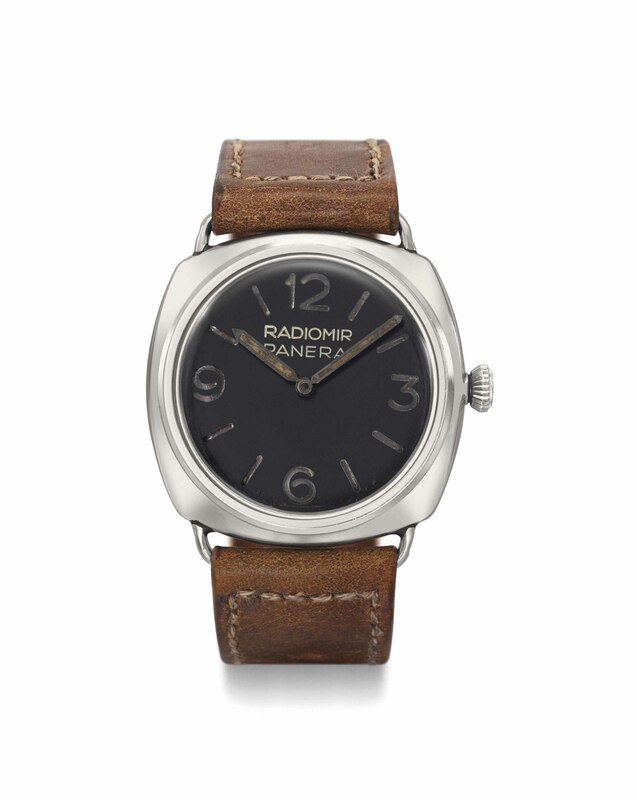 3646 were made by Rolex for Panerai following strict technical requirements, notably a 47 mm. wide cushion-shaped case with soldered curved wire lugs, screw down "onion" crown, 12-sided case back and a Perspex crystal. The black dials were coated with "Radiomir" luminous material, the upper black dial plate was cut out for the half Arabic and half baton numerals, the so-called "no-name" series without any further markings or designations. The particularity of the luminous blued steel hands is the small divider or separation in the center of the hour hand. The 15 3/4''' lines calibre 618 Cortbert movements were finished by Rolex and decorated with the Geneva stripes. Around 1950, reference 3646 was replaced by references 6152 and 6154. On lots marked with an + in the catalogue, VAT will be charged at 8% on both the premium as well as the hammer price.